August 30, 2003 - this project is no longer available. Hex code for the 68HC705K1 processor used in this project is available upon request, but parts and PCB's are not. Please also see our in process news for more information. This project provides a LED display of the unit codes 1 through 8 of any selected X-10's specified HouseCode. 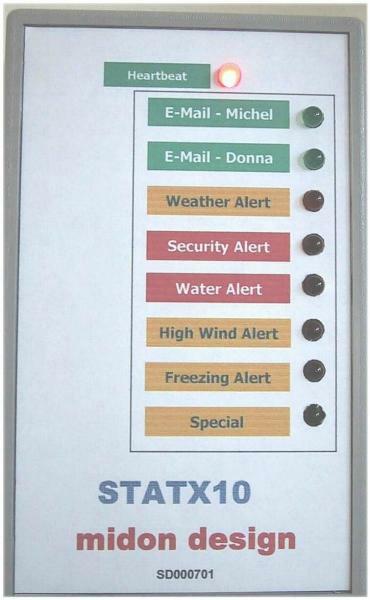 The STATX10 can be used to show status of other areas of the house, or, in conjunction with a macro-capable X-10 controller, can be used to display status of any events (received e-mail, weather alerts, security system status, etc.). It can also be used to trouble-shoot X-10 transmitted signals. A simple power supply, consisting of U4, D12, C7 and C8, converts 12 volt AC or DC to the 5 volts required for the main-board circuit. A LM78L05 version of voltage regulator was used due to the low power consumption (less than 90 mA, worst-case) of the circuit. LED D3 is used as a heart-beat indicator (I always like to know that the software is running!) flashing once per second. Standard construction techniques may be used for this circuit and a printed circuit board is available if desired. 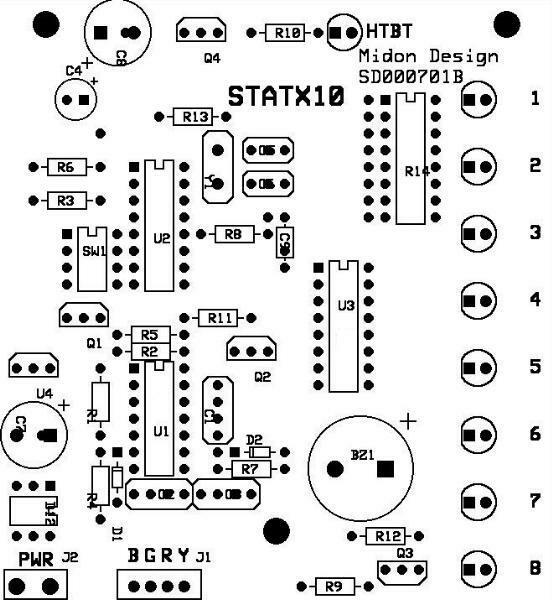 If building the STATX10 from the PCB, refer to Figure 3 for component placement. Begin by inserting IC sockets (highly recommended) for the 3 IC's (none is required for the DIP resistor). Follow this with the insertion of all passive components. I like to proceed by inserting all resistors, then all capacitors. Watch the polarity of the electrolytic capacitors. The positive lead of the electrolytics is the square pad for that component. Then, insert the LED's, placing them so that the flat side of the LED is oriented towards the square pad on the PCB. Insert the DIP resistor R14 (polarity is not critical, but if it makes you feel better, orient the device so that pin 1, usually marked with a dot, is inserted to the square pad of R14). Insert the crystal now. There are 6 types of resistors; 1K, 10K, 5.1K, 22K,100K and 330. The color codes for these are shown in Table 1. Insert the resistors where shown in Figure 3. I've left pads available for you to use 8 discrete 330 ohm resistors instead of a DIP network for R14. Next, insert voltage regulator U4 and full-wave bridge D12. At this time, you should also connect a 12V (AC or DC) "wall-wart" power supply to the PCB pads marked as J2. Power up and then measure voltages between pins 14 and 7 of IC U1. Pin 14 should be +5 volts while pin 7 is 0 volts. If you are wiring this circuit on your own board, then check polarity on the other IC sockets as well. Table 2 shows the voltages required on each IC. Turn off the power now. Connect a telephone style cable to the pads marked J1. Note that the telephone cable should have an RJ-11 (telephone plug) connector at the other end. 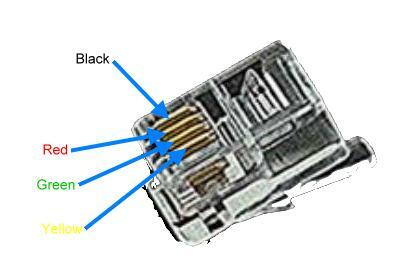 Inspect the color code of the wires in the see-through plug to make sure they are wired as in Figure 4 below. If they are then connect the other end of the cable in the following fashion; the red wire should connect to the R pad, the green wire to the G pad, etc. (you get the idea). If the wires are reversed, as will sometimes happen, then make the appropriate changes to the wiring at location J1. You are now ready to prove in the circuit. Carefully insert all IC’s in their sockets, observing polarity while doing so. Now reconnect the power. The HTBT LED should be flashing, while the rest of the LED's are off. If the LED is not flashing, remove the power and check for any solder bridges on the board. You can also check to make sure that the micro-processor is correctly installed (no bent pins, proper orientation). If you have an oscilloscope, turn the power back on and make sure that there is a high-frequency (4.0MHz) signal at pins 15 and 16 of the micro-processor. Don't worry if the signals look different on each pin. If this looks OK, look for a 60Hz square wave on Pin 1 of U1. Lastly, make sure that transistor Q4 and LED D3 are properly inserted. To check out the operation, connect the phone cable to a TW-523 X-10 transceiver. Set the DIP switch SW1 to your selected House Code per Table 3. Power back up. The LED corresponding to Unit Code's 1 through 8 of your configured House Code should turn on or off to match other units transmitting to those Unit Codes. If you want to add a label to your project, consider something like the following. This label fits the suggested enclosure. An optional enclosure is available from RadioShack.com as part number 910-1087 (Pactec HP-9VB). If you need a source for a power supply, we suggest a Jameco p/n 167089 or equivalent. An equivalent power supply can also be ordered from Midon Design as part number MD3004 (see our price list). You will also need an X-10 TW-523 module (Midon Design part number MD3001). Specification Sheets are in Adobe Acrobat format. If you wish to download Adobe Acrobat Reader, go here .